Dysphagia Cup by North Coast Medical at Bijc. MPN: NC35269. Hurry! Limited time offer. Offer valid only while supplies last. Dysphagia CupUnique shape provides control for persons with dysphagia.This mug is designed to direct the flow of liquids to the center of the mouth. 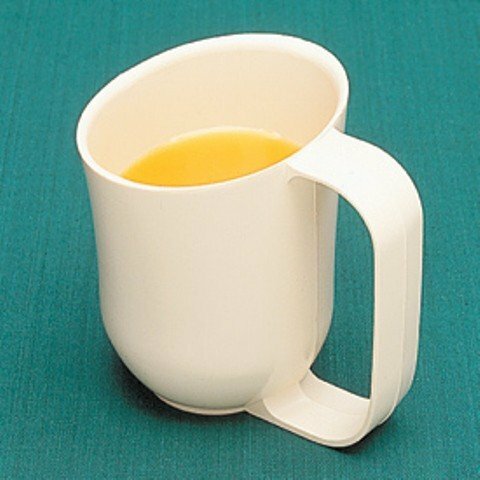 Dysphagia CupUnique shape provides control for persons with dysphagia.This mug is designed to direct the flow of liquids to the center of the mouth. Unique shape provides control for persons with dysphagia. Allows for drinking liquids or thickened liquids without tilting the head back. Large handle is easy to hold. Hand easily fits through the handle, making it ideal for persons with weak grasps. Mug holds 8 fl. oz. (237ml). Weighted base adds stability. Household dishwasher and microwave safe. Autoclavable. This is an hygiene product and cannot be returned. Product photo may not exactly match the product offered for sale. Please refer to the product description.